Eliminating the precipitate from Bordeaux Etch by generating electricity in the etching tray or tank. 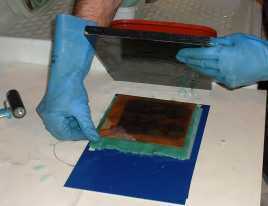 A "passive" process for zinc plates using Copper Sulphate. Application of the passive process to Galv-on semi-dry method. Extract from GREEN PRINTS by Cedric Green published by Ecotech Design, Sheffield, UK. - a handbook on new methods for non-toxic intaglio etching and metal plate printmaking, featuring the technique of Galv-Etch, a modern development of the 19th century electrolytic technique of Electro-Etching, and introducing Fractint and other new alternative methods avoiding the use of solvents and chemicals harmful to health and to the environment. 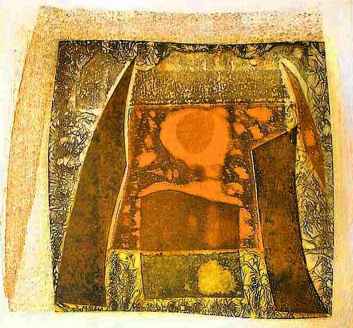 The sandwich of plate, dry blotting paper, tissue papers, felt etc. backed by the thick layer of soaked felt and then, the copper cathode plate connected to the copper strip from the back of the zinc plate and board being laid down to receive the weight. The electricity generated results from the difference in what is called the 'electrode potential' between zinc and copper, and closing the circuit between the plates allows a current to flow, 'pushed' by the flow of positively charged copper ions towards the copper or negative cathode, displaced from the solution by the zinc. The disadvantage is that the electrolyte becomes exhausted as its copper is gradually replaced by zinc, and it must be disposed of safely (see below). For those willing to tangle with a powered electrolytic process the great advantage is that the electrolyte can be used for years, and one is not limited to etching zinc.